This video courtesy of Palmer College of Chiropractic. www.palmer.edu. The brain controls all the body's functions. It communicates with other parts of the body by nerve impulses. Most of these impulses are relayed to the other body parts via the spinal cord. 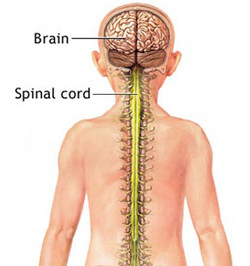 The spinal cord is protected by the spinal column, which consists of individual vertebrae separated by cushioning discs. From the spinal column, nerves network out between the vertebra to most of the organs and muscles in the body. Upon exceptional stress to your spinal column, such as an accident, years of poor posture, or long-term tension, the vertebrae can slip out of position and "pinch a nerve." The term for this condition is SUBLUXATION. A vertebral subluxation is a misaligned vertebra causing interference with nerve messages between the brain and the body. This can cause symptoms of backache, tingling in the arms and legs, headaches, fatigue, improper digestion and other system dysfunction. Now that we know how the body works we can begin to understand how chiropractic works. Chiropractors locate subluxations and through gentle adjustments can restore the body's normal functions. With nerve passages open and regulatory impulses free to pass, the body's miraculous nervous system can heal itself. Chiropractic goes directly to the root of the problem. It does not mask symptoms as painkillers and frequently addictive prescription drugs often do. There is an opioid crisis in the United States and Chiropractic is the answer to preventing more people from becoming addicted to these highly dangerous painkillers. Try the natural choice first! Try Chiropractic! Question: Can chiropractic help me even if my medical doctor didn't prescribe it? Answer: Yes! A chiropractor has extensive training in problems of the spine. A chiropractor is the only person qualified to determine if a problem can be treated with chiropractic. Question: Do chiropractors treat other problems in addition to problems of the spine? Answer: Of course! Your nervous system controls every part and function of your body. Subluxations of your spine can press or pinch nerves that control almost any part of your body. By adjusting the spine, a chiropractor can help many problems that may not seem to be related to the spine. See Conditions Successfully Treated by the Doctors. Question: Am I too old for chiropractic? Answer: Never! Chiropractors employ various adjusting techniques. Some are very gentle non-force techniques appropriate for the elderly. Question: Can chiropractic help my children? Answer: Most definitely YES! Children fall down. It's part of childhood. This can occasionally cause problems. Some of these problems may not show up for years. Chiropractic can detect and correct these problems before they manifest themselves painfully in adulthood.